Bug Authority has noticed an increase in calls for rodent and mouse control in recent months, and people in Greater Nashville are asking why there are so many mice lately? The answer encompasses many reasons. In general though, one reason is because Nashville’s population is growing at an accelerated rate. This increased population provides an abundant food supply for mice. A larger population creates more food waste (garbage) and adds additional sources of food through other means such as landscaping (vegetation and ornamental fruit), pet foods, bird feeders, etc. 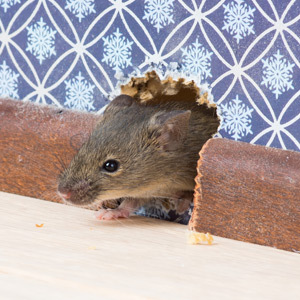 Increased population and its accompanying suburban expansion also provide more shelter for mice. Obviously, there are more homes and apartments, but even the landscaping provides additional harborage for mice in ground covers and mulch. Add to this the fact that as Nashville grows older, it provides more harborage in its aging sewers and aging infrastructure. The environment is also friendly to the mouse population. Warmer winters allow more mice to survive, and urban sprawl decreases natural predators such as hawks and owls. Mice naturally reproduce at a staggering rate. In three months, 6 mice can multiply into 60 mice. With the three-fold combination of an abundant food supply, plentiful shelter, and a “friendly” environment in middle Tennessee , it is not surprising that the mouse population is exploding. Mice are carriers of disease, including e. coli., salmonella, ringworm (which also can be passed to cats and then to humans), and leptospirosis (caused by exposure to rodent urine). Bites from mites that live on rodents also transmit skin diseases such as dermatitis and rickettsial pox (a rash similar to chicken pox). control weeds and leaves outside the home and to keep wood piles away from your home. Setting snap traps is a good way to determine if you have a mouse problem, but ultimately it is not a good way to control a problem. Trapping can’t keep up with the reproduction rate fast enough. Once a mouse problem is identified, professional rodenticides are called for. These rodenticides are controlled substances that can only be administered by licensed exterminators like Bug Authority. If you are having issues with mice and rodents and think you may need our mouse control service please contact us a 615-472-1292 today.